Westgate Lodge01263 512840work Bed & BreakfastWestgate Lodge is a comfortable former hotel with parking space for all guests' cars. Situated just off the seafront with easy access to the beach, putting, bowling green and close to the town centre. All bedrooms are en-suite (showers) TV, radio, hairdryer, trouser press and tea and coffee making facilities. Full central heating throughout. 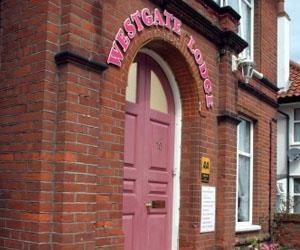 Westgate Lodge is a comfortable former hotel with parking space for all guests' cars. Situated just off the seafront with easy access to the beach, putting, bowling green and close to the town centre. There is a wide choice to choose from on our breakfast menu to suit all tastes. Just off seafront at the west end of Cromer, opposite putting and bowling greens.